ACE will begin with the first general session following the pre-conference workshops on Sunday, May 5, at 5 p.m. General sessions, super sessions, deep dives, facilitated labs, and workshops offer attendees a variety of learning options based on tracks that align with their interests, including the following: investment management, wealth management, advanced business strategies, retirement management, distribution excellence, and institutional consulting. ACE also will offer attendees unique experiences and new forums for learning such as EDTalks on the Exhibit Hall floor, book signings, and an Oculus virtual reality experience. Also new this year are a NexGen Reception that will feature Vegas gaming lessons, a VIP Women in Wealth Luncheon, and an International Member Breakfast. 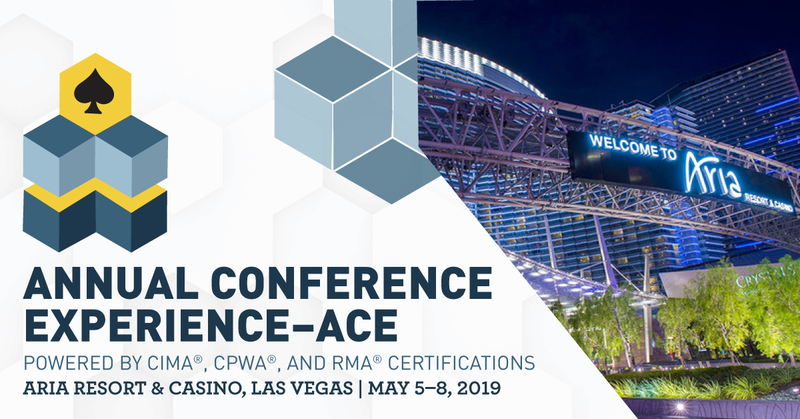 ACE 2019 in Las Vegas offers up to 24 hours of live and online continuing education (CE) credit, including one hour of ethics CE for Certified Investment Management Analyst® (CIMA®), Certified Private Wealth Advisor® (CPWA®), and Retirement Management Advisor® (RMA®) certificants. Registration is now open for Annual Conference Experience. For detailed event information, visit the Annual Conference Experience event web page. Early-bird pricing ends April 5, 2019. Topics for ACE sessions are 100 percent peer-reviewed and based on the Investments & Wealth Competency Matrix, the foundation for all of the Institute’s educational offerings.